Fighting athletes use different weight reduction techniques. We can distinguish chronic weight loss, which consists of the reduction of body fat and eventually loss of muscle mass and acuteweight loss, which may include techniques such as reduction in muscle glycogen, rich and poor residual diet rotation, electrolyte manipulation, “water loading “(Morton et al., 2011, Reale et al., 2017) and many other methods. The above techniques are commonly used, but rarely the players use them correctly. This significantly increases the risk of health complications – hence the images of players brought for weighing “on a stretcher”. Strategies that include the use of diuretics and laxatives, active and passive methods of sweating are widely used – which I consider to be unacceptable. 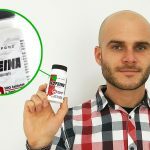 I discuss the procedure of professionally made rapid weight reduction at training “Nutrition and supplementation in martial arts”. In today’s article, I would like to focus on one of the techniques – “loading water”. It belongs to commonly used methods of rapid weight reduction (Crighton, Close et al. 2015, Matthews and Nicholas 2016), also among my players. Recently, the first study on the impact of “water loading” on the effectiveness of rapid weight loss and the safety of this method has been published. In the article below I am referring to this publication. 21 grapplers (bjj players, wrestlers) took part in the study. Everyone had at least 4 years of experience in the competition, trained at least 8 hours per week, had experience with the procedure of “weight cutting” and previously used the method of “water loading”. Ten of them were randomly assigned to the control group, eleven were randomly subjected to the so-called “Water loading”. All athletes were subjected to a diet with an energy load of 125 kj / kg FFM at that time, which was a moderate energy deficit characteristic of this “weight-making” stage. The distribution of macronutrients was: protein 2-2,5g kg / FFM, carbohydrates 5-6g kg / FFM, fats 1-2g kg / FFM. The sodium content was 300mg / Mj, fiber 10-13g per day, which corresponds to the residual diet recommended for fighters in the last 2-3 days before weighing. During the first 3 days of the study, participants in the control group consumed 40 ml of water / kg body weight, while in the experimental group the water supply was 100 ml / kg body weight. On the fourth day all participants of the study received 15 ml of water / kg of body weight. On the fifth day of the experiment, the players did not receive any fluids until morning tests. Subsequently, the study participants underwent the same rehydration process and examined the impact of both interventions on exercise parameters. The competitors performed two training units a day on days 1-3, one on the fourth day of the study and zero on the fifth day when they recorded the lowest body weight (before the rehydration procedure). Body weight, urine sodium concentration, weight loss, sweat loss during training, urine output, renin hormone levels, aldosterone, vasopressin, sodium, chloride, potassium and sodium levels of urea and creatinine were monitored. The sodium concentration was controlled to verify that the above method is safe and does not cause hyponatremia, i.e. a drastic decrease in serum sodium concentration. The protocol for collecting laboratory data included morning fasting tests at 7 am (day -1 to day 6) and evening test at 18 (day 1-5). The competitors did not eat 3 hours and did not drink an hour before the evening tests. Urine, venous and capillary blood collection, BM (body mass) measurements, blood pressure, and pulse were performed. Athletes also filled out a questionnaire of gastrointestinal symptoms (GI). Total body weight was measured on the Tanita device and sweat loss was determined on training based on estimates (ie sweat loss = change in BM + fluid intake – urination). The above figures show the changes that occurred in terms of body weight and the level of vasopressin in study participants. The competitors from the experimental group obtained a higher loss of total body weight as a result of the intervention, i.e. a supply of water in the amount of 100 ml / kg BM on days 1-3. (3.2% vs. 2.4% in the control group). The high intake of water on days 1-3 was associated with greater urinary excretion in both days 1-3 and days 4-5. The combination of moderate energy deficit, poor residual diet and one day of fluid restriction resulted in a 3.2% weight loss in the experimental group and 2.4% in the control group. There was no deterioration of the results of exercise tests in the group subjected to “loading water” after the hydration process. Presumably, taking into account other variables and techniques used by competitors would result in a more spectacular result of the study. Weight loss was achieved in a scenario simulating the preparation for weighing and participation in combat sports competitions, but without resorting to more extreme practices related to severe limitation of energy supply and commonly observed active dehydration (eg saunas, hot water baths), application diuretics and laxatives, etc. The diet plan for athletes before the start of the study was also not standardized, which could have an impact on weight loss, especially in the first two days of the study. It is well documented that the intake of excess fluids poses the risk of hyponatremia (Adrogué and Madias 2000), which can lead to serious health complications, even to death (Garigan and Ristedt 1999, Adrogué and Madias 2000). In the present study, however, there were no clinically significant, dangerous changes in the results of blood tests in both the experimental group and the control group. In the experimental group during the “water loading” period, lower blood sodium levels were observed, however, the values ​​did not exceed the dangerous threshold (below 135 mmol / l). Nevertheless, the level of aldosterone in the experimental group remained lower throughout the study period than in the control group. 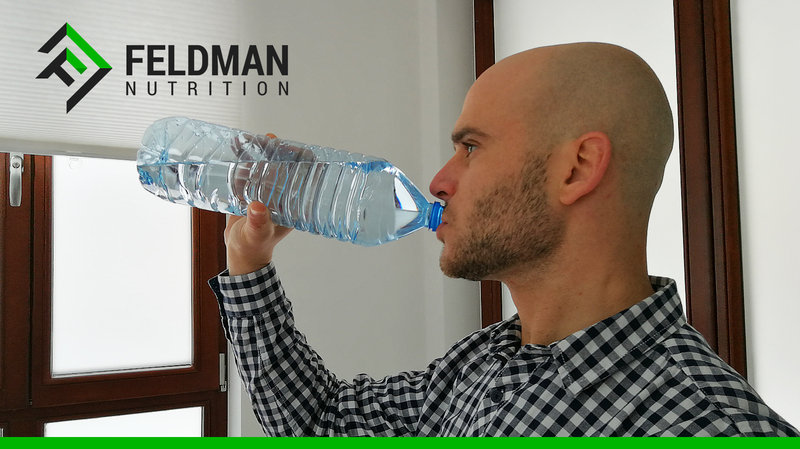 The “water loading” protocol used does not increase the risk of hyponatremia and other health hazards. It is risky to consume more than 10 liters of low mineralized water in less than 6 hours, which may pose a health risk (Garigan and Ristedt 1999, Adrogué and Madias 2000). 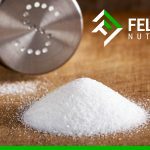 In the future, it would be worth to verify in the study the increase in effectiveness and safety of the protocol being carried out with the implementation of a drastic reduction in dietary sodium supply in the last phase of “water loading” until reaching the culmination of weight loss, which is usually applied by competitors before weighing. We also do not know if the blood sodium concentration did not drop below 135 mmol / l except for the moments in which the diagnosis was performed. The effect obtained in the experimental group is related to the inhibition of vasopressin secretion during the “water loading” period. Participants in the experimental group maintained an average lower level of vasopressin on days 1-3 from participants in the control group. The concentration of sodium in the blood was lower in the “water loading” group, however, it was unified with the control group after the cessation of the loading procedure. Because vasopressin is under the influence of osmoregulation (Robertson et al., 1976), the decreasing content of sodium in the blood and the high water supply have affected the observed suppression of vasopressin. In addition, vasopressin combines with vasopressin-2 (V2R) receptors found in the renal tubules. This initiates a cascade that increases the permeability of collecting channels, and hence the reabsorption of water, by changing the density of aquaporin channels (Verbalis 2003), in particular the channels of aquaporin-2 (AQP2). Conversely, in the absence of vasopressin, the AQP2 channels (hence water reabsorption) are reduced (Verbalis 2003). This mechanism was directly observed in rodent models – with a 24 hour water load, there was a reduction in intra-epithelial AQP2 channels and a reduction in water permeability in the kidney collection channels (Lankford, et al., 1991, Knepper 1997). In addition, vasopressin infusion has been shown to increase mRNA for AQP2 channels (Knepper 1997). In rats unable to produce endogenous vasopressin, exogenous vasopressin may take 3-5 days to elapse before the mRNA expression of the AQP2 channels returns to normal (Kishore et al., 1996). While the current data can not fully confirm this hypothesis, this mechanism probably explains the persistent loss of fluids visible after water restriction in the experimental group. In a word, the increasing level of vasopressin after discontinuation of “water loading” affects the AQP2 channels causing delayed water retention – during this time, players are able to get rid of excess water from the body. 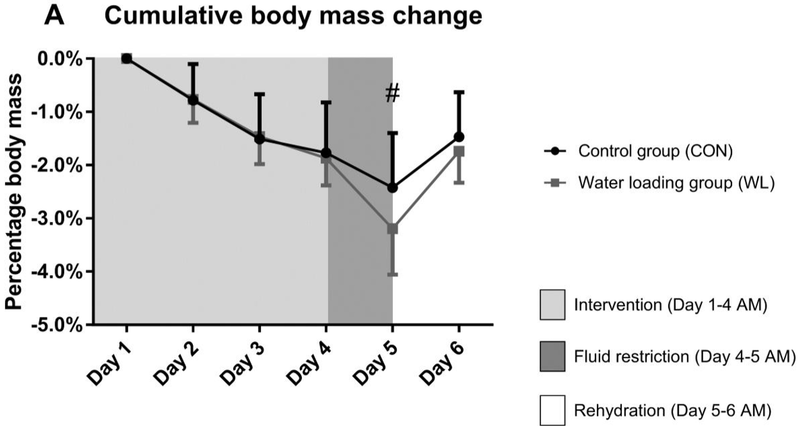 Three days of “water loading” (100 ml / kg FFM), before one day of fluid restriction, appears to be a safe and effective method of rapidly reducing body weight by increasing fluid excretion. Increased water supply creates a small but potentially physiologically significant decrease in blood sodium concentration, which inhibits the release of vasopressin and reduces the regulation of the appearance of AQP2 channels in the collecting ducts in the kidneys. When used directly prior to fluid restriction, there is a continuation of increased fluid loss leading to greater losses compared to fluid restriction alone. In my practice I use with the players both the method of “loading water” and other methods of rapid weight reduction in the period before weighing. These techniques include the rotation of a richly and poorly residual diet, depletion of muscle glycogen, electrolyte manipulation and other techniques that I discuss in training “Nutrition and supplementation in martial arts” Undoubtedly, further research is needed in the field of effectiveness and safety of violent methods commonly used by competitors. Adrogué, H. J. and N. E. Madias (2000). "Hyponatremia." New England Journal of Medicine 342(21): 1581-1589. Garigan, T. P. and D. E. Ristedt (1999). "Death from hyponatremia as a result of acute water intoxication in an Army basic trainee." Military medicine 164(3): 234. Robertson, G. L., R. L. Shelton and S. Athar (1976). "The osmoregulation of vasopressin." Kidney international 10(1): 25-37. Verbalis, J. G. (2003). "Disorders of body water homeostasis." Best practice & research clinical endocrinology & metabolism 17(4): 471-503. Lankford, S. P., C. Chou, Y. Terada, S. M. Wall, J. B. Wade and M. A. Knepper (1991). "Regulation of collecting duct water permeability independent of cAMP-mediated AVP response." American Journal of Physiology-Renal Physiology 261(3): F554-F566. Knepper, M. A. (1997). "Molecular physiology of urinary concentrating mechanism: regulation of aquaporin water channels by vasopressin." American Journal of Physiology-Renal Physiology 272(1): F3-F12. Kishore, B. K., J. M. Terris and M. A. Knepper (1996). "Quantitation of aquaporin-2 abundance in microdissected collecting ducts: axial distribution and control by AVP." American Journal of Physiology-Renal Physiology 271(1): F62-F70.